The students, accompanied by Professor Dale Stephens and Dean Melissa de Zwart, also made stops in Washington D.C., and Cambridge, Mass. The Space, Cyber, and Telecommunications Law program and the International Law Students Association are hosting the group. Since 2008, Nebraska has been the only law college in that nation to offer an LL.M. degree in space, cyber, and telecommunications law. The program, available on-campus or as an interactive online program, allows students to bridge the gap between law and technology. 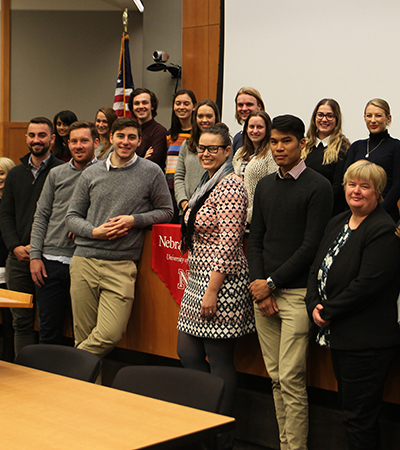 While in Nebraska, Adelaide students met with Professors Jack Beard and Matthew Schaefer to focus on the laws and policies specifically relating to national security and space law. In addition, the Australian students attended law classes, learned about legal structures at the Nebraska Capitol and United States Court of Appeals for the Eighth Circuit, visited the Strategic Air & Space Museum, and experienced the daily life of an American law student.